Our Rajasthan Tour with Varanasi is an extended journey through northern India, which has been crafted to reveal the highlights of this fascinatingly diverse region. Soaking up many different facets of Indian culture, this immersive journey begins by exploring the majestic capital city of Delhi, followed by the ancient and sacred city of Varanasi, before arriving in Agra – home of the world’s favourite monument to love; the Taj Mahal. Continue your journey by exploring what we do best – the regal state of Rajasthan, whose fascinating history is told in innumerable legends and evidenced by its towering forts and dramatic scenery. Take your time to soak up the rich heritage and splendid architecture of Jaipur and Jodhpur, and track wild Bengal tigers in Ranthambhore National Park. The easy-going lake city of Udaipur is the perfect place to end your journey, with its fairy-tale like palaces and romantic lakes. Your Rajasthan with Varanasi tour kicks off upon landing in Delhi, where you’ll be met by a member of our team and chauffeured to the Lodhi for a two-night stay. Formerly the Aman New Delhi, this hotel is arguably the finest in the city. It’s located in a lively but very green area of Delhi, close to the city’s Lodhi Gardens, from which it takes its name. The ambience is hushed and the decor is slick, drawing in a cool crowd of Delhi socialites. Each of the 40 rooms is the size of a small apartment and come with a very generous sitting area, workstation, dressing room and spacious bathrooms – best of all, they each have their own private plunge pool! A guided tour of both Old and New Delhi today will introduce you to the Jama Masjid, Qutab Minar, India Gate, Parliament House, Humayun’s Tomb and the Sikh temple. The itinerary we’ve prepared in advance is a guideline and is completely flexible to your preferences on the day – you may let your guide know your interests and he will tailor the day to better suit your tastes (we’re known for our flexible approach, allowing you complete control over the pace of your trip). After exploring the bustling capital, you’ll return to the Lodhi. 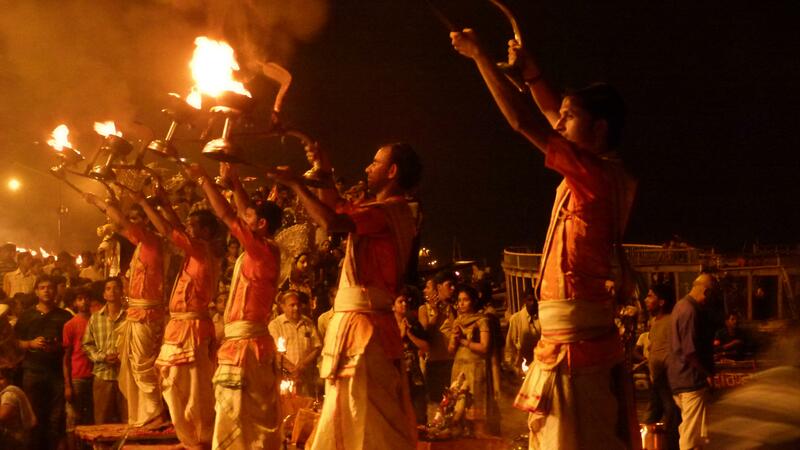 Board a direct flight to Varanasi this morning. Upon landing, you’ll be chauffeured to the Taj Nadesar Palace, where there’ll be a few hours to relax, settle in, and enjoy your surroundings. Nestled in the heart of this bustling city, amongst mango orchards, marigold and jasmine fields, lies the Taj Nadesar Palace. Built by the East India Company and acquired by Maharaja Prabhu Narain Singh in the 19th century, the palace is named after goddess Nadesari, whose shrine is located in the front of the palace. Stepping into its portico, your journey into the Maharaja’s residence begins. The luxurious suites are generously sized, with large windows overlooking the gardens and spacious bathrooms in cool white marble. Alternatively, to really take in the incredible scenes that take place along the ghats, stay at Brijrama Palace – a charming boutique property on the banks of the river Ganges. Rise early and return to the Ganges this morning for a sunrise boat ride. A sunrise boat ride is the highlight of a trip to Varanasi when the temples along the riverfront are bathed in soft light. The people of Varanasi trickle out of the labyrinthine lanes and head for the ghats at dawn. Later, visit Sarnath – where Buddha preached his first sermon after enlightenment, and the old city – a maze of streets and alleys crammed with derelict palaces, homes, and hundreds of temples and shrine. Here you’ll see funeral processions, cows and goats munching on whatever they can find! You’ll also explore a winding lane known as Vishwanath Gali, which is lined with a multitude of shops selling all manner of religious objects. It leads to the city’s principal shrine, the Vishwanath Temple. Board a direct flight to Agra this morning. Upon arriving in Agra, the rest of the afternoon is at your leisure to enjoy your hotel and soak up the delights of the Oberoi Amarvilas. Situated only 600 metres from the Taj Mahal, the Oberoi Amarvilas is renowned for its luxury and style. The stunning swimming pool and perfectly manicured gardens make this an ideal hotel to rest and relax at. All rooms and suites afford an uninterrupted view of the Taj Mahal – without the restriction of visiting hours, you can catch the Taj Mahal peachy pink at dawn, glowing amber at sunset and glittering in the moonlight after dark. Enjoy a day of safari, on the trail of tiger, in Ranthambhore National Park. Ranthambhore is well known as one of the best spots in the world to view the majestic Bengal Tiger in its natural habitat. Your safaris will be in a private jeep, with only you and your experienced naturalist guide. Today you’ll continue to the Pink City – Jaipur. Upon arriving in Jaipur, you’ll be assisted with checking in to the opulent Oberoi Rajvilas for a two-night stay. As there’s no sightseeing scheduled for today, it’s completely up to you whether you’d like to spend the morning enjoying your Luxury Tent at the Oberoi Vanyavilas and set off after lunch, or start early to make an afternoon of it in Jaipur. Either way, your chauffeur is always on hand to take you anywhere you’d like to go. A drive through the scenic Aravalli hills today takes you to Jodhpur – Rajasthan’s fabled Blue City – for a two-night stay at Raas. This glorious little hotel lies at the foot of the mighty Mehrangarh Fort, in the heart of Jodhpur’s Walled City. It is the only luxury hotel to be based in the old town and the views of the fort looming above are quite spectacular. Strolling away from the excitement and hustle and bustle of the old town and walking under Raas’ imposing gateway is like entering a blissfully peaceful, hidden oasis. Alternatively, stay at the palatial Taj Umaid Bhawan Palace in Jodhpur – another of our favourites. Those who prefer to stay in a central location and immerse themselves in the city will be happier at Raas, whilst though who value history, space and grandeur will prefer the Taj Umaid Bhawan Palace. A guided tour of the Blue City today will introduce you to Jaswant Thada and the majestic Mehrangarh Fort. Continue with a walking tour through the labyrinthine lanes of the Old City, before heading out to the sandy outskirts by Jeep. The arid countryside south of Jodhpur is dotted with villages, their mud and thatch huts inhabited by the Bishnois and communities of potters and weavers. A tour of this area provides a memorable opportunity to observe the rhythm of daily life in these hamlets, experience the warm hospitality of the villagers, and see beautiful traditional crafts being practised. This morning you’ll continue to the romantic city of Udaipur. On the way, break your journey in Ranakpur to explore one of India’s most elaborately carved temples. Your base in Udaipur will be the spectacular Oberoi Udaivilas. Resting on the banks of Lake Pichola, the Oberoi Udaivilas is unashamedly opulent and is something straight out of a fairy-tale. The Oberoi Udaivilas is our personal favourite of the Oberoi hotels. It’s unashamedly opulent and really the definition of luxury. In 2015, the Oberoi Udaivilas hotel was ranked as the ‘Best Hotel in the World’ by readers of Travel + Leisure magazine in the US. If you can tear yourself away from the exquisite Oberoi Udaivilas, you’ll be accompanied by your guide to explore the city of Udaipur. To begin, a walking tour through the narrow streets of the old city will take you through winding streets teeming with shops selling clothing, silver jewellery, and leather-bound journals. You’ll shortly approach the City Palace – this sprawling palace is the largest in Rajasthan and stands on a ridge overlooking the lake. Cupolas crown its octagonal towers, which are connected by a maze of narrow passageways. The rooms inside the City Palace all contain decorative art: beautiful paintings, colourful enamel, inlay glass-work, and antique furniture. You’ll also explore the 17th century Jagdish temple and Saheliyon-ki-Bari (a beautiful rose garden). Enjoy a leisurely morning in Udaipur, relaxing at the Oberoi Udaivilas or further exploring this easy-going town at your own pace. Board a direct flight back to Delhi in the afternoon. Upon reaching Delhi you’ll transfer to the Oberoi Gurgaon for a last night. Alternatively, for those who’d like to experience the Indian railways, you can instead travel back to Delhi by overnight train. Or, should you prefer to connect directly from Udaipur to your onward destination, this suggested last night in Delhi can be omitted. Our journeys are inclusive of accommodation with breakfast, a private car with driver throughout, experienced guides, internal flights, entrance tickets and excursions. In other words, we offer a seamless and hassle-free experience where the only thing you need to worry about is soaking up the sights and enjoying your fabulous hotels! This indicative cost is based on a couple travelling between October 2018 and March 2019, sharing a double or twin room. The cost would reduce significantly during the low-season months of April to September, whilst it would be noticeably higher during the peak Christmas and New Year period. When selecting a date to begin your Rajasthan with Varanasi tour, it would be important to keep in mind that the direct flight from Varanasi to Agra operates only three days a week; every Monday, Wednesday and Saturday. Optionally, rather than retrace your steps back to Delhi, you may prefer to end with a two night stay in Mumbai (we’d suggest the Taj Mahal Palace, or the Oberoi Mumbai). Those with a keen interest in architecture may like to include a stop in Khajuraho (the Lalit Temple View), famed for its extraordinary carvings. Or, experience Rajasthan’s golden dunes with a visit to Jaisalmer on the edge of the great Thar Desert (The Serai). All our journeys are private and tailor-made to complement your tastes and interests – the Rajasthan with Varanasi tour described above is really just a starting point and together we can refine it into your ideal Indian experience.